“The dream of a violin that can play itself has tantalized inventors for over a century.” Well . . . mad scientist inventors, maybe, along with dreams of self-cleaning carrots and ironing boards that can go into battle. 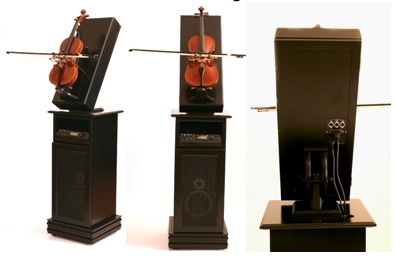 Nonetheless, here it is: I give you the Gulbransen Virtuoso Violin, a QRS Pianomation Player Violin. Put on a violin piece, and it sounds like the violin is really there — because it is. Ain’t no digital samples here, just a MIDI-controlled bow hacking away at a real violin. List price, $20,000, but for some reason it’s at a fire sale bargain-basement discount bin price of US$12,500. I’d love to feed it some unplayable Max/MSP patch, but they’ll have to let me get my hands on it first. And if there are audio samples there, I can’t get at them. Anyone else know about this bizarre invention? You’ll also find other instruments on the site, like the . . . hold on, this calls for another post. Thanks, LeMel!